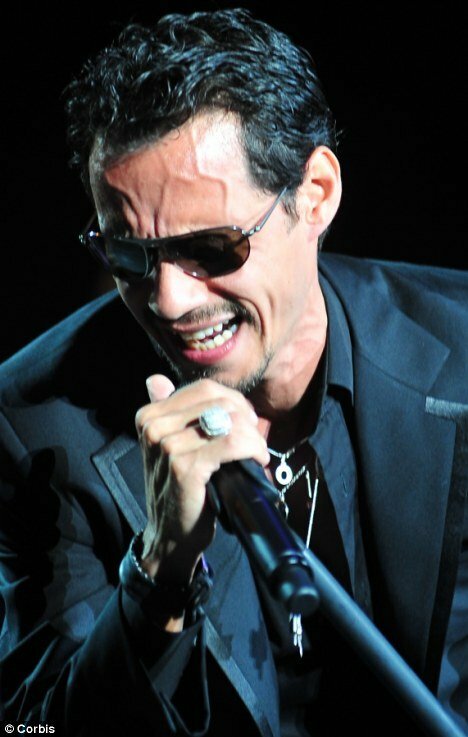 Marc Anthony in tears on stage of Miami. Home Entertainment Marc Anthony in tears on stage of Miami. Marc Anthony seemed to crack under the emotion when he ended up weeping live on stage in Miami and cried when his fans sang him happy birthday. Marc Anthony, who turned 43 on September 16, soon composed himself, and gave a trademark blisteringly passionate performance for his fans. The latino singer performed mostly in Spanish, but still managed to keep the enthusiastic audience on their feet all night. At one point Marc Anthony again hinted at his recent heartache after the breakup of his marriage, he introduced his suffering in love song Until I Met You, Hasta Que Te Conoci, and called it “complicated”. Later in the evening, his teenage daughter Ariana presented him with a three-tier, black and white birthday cake, while the crowd serenaded him once again. But Marc Anthony did not stop there, as around midnight he went to a private birthday party at Club 50 inside Miami’s Viceroy Hotel with around 150 close friends. However, Marc turned out to be a bit of a party lightweight as after telling chums he was issuing an “executive order to stay, drink as much as you can and party all night,” he slunk off to get some rest before the rest of his weekend concerts. Reno air crash toll: 9 deaths and 69 injured. Alexander Lebedev punches Sergei Polonsky during TV debate.